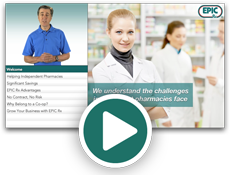 PharmCAP® is your Pharmacy Compliance Alert Program! PharmCAP was developed to assist you in managing your pharmacy’s mandatory compliance requirements for Medicare Part D, CMS, Office of Inspector General, Drug Enforcement Administration and other federal and state regulatory authorities, as well as, third party payers. Please note PharmCAP is only available to EPIC Pharmacy Network, Inc. members. If you are interested in joining the EPIC Pharmacy Network, Inc., we encourage you to visit their website at www.epicrx.com or by calling toll free 1-800-876-3742. PharmCAP gives you the tools to protect your pharmacy and provide you with peace of mind that your store is in compliance. Once your pharmacy and workforce related information is loaded into the system, PharmCAP provides you with a simple point-and-click process that gives you all the tools and documents you need to meet compliance and credentialing requirements. If a required document needs to be returned to PharmCAP you simply fax or electronically upload the document to us...that’s it. PharmCAP reviews the document for accuracy, electronically files it in your pharmacy’s document folder to which you have 24/7 access, and then PharmCAP will remind you via fax or email the next time the requirement is due. All you need is a computer with internet access, a fax machine and a printer. Thank you for this service/program. I would never be able to stay compliant without this help. The alerts are great, they help us keep up with what is due. Staff is very helpful if we have questions. Bula is a leading national expert on pharmacy regulatory intelligence. Bula tracks regulations, rules and policies in all 50 states and notifies PharmCAP with actionable intelligence of any changes that could potentially impact PharmCAP members. The Alliance for Patient Medication Safety, a federally listed Patient Safety Organization (PSO), provides the Pharmacy Quality Commitment CQI program in order to help you meet your quality assurance requirements. InfiniTrak is a cost-effective and complete solution to all your Drug Supply Chain Security Act (DSCSA) compliance requirements, centralizing and automating all the business requirements and processes required by the law. Private Eyes is an industry leader in background checks and is NAPBS accredited and ISO 27001 certified. They provide com-prehensive pre-employment screening services such as high-quality employment background checks to their clients globally. Let PharmCAP ease the burden of meeting the overwhelming number of compliance requirements that pharmacies face today. Call (888) 559-2039 for more information. PharmCAP is only available through an EPIC Pharmacy Network, Inc. membership. Learn more about EPIC Pharmacy Network membership at www.epicrx.com or call 800-876-3742. DISCLAIMER: Use of the PharmCAP® program does not negate in any manner your responsibility for ensuring your pharmacy operates in compliance with all applicable state and federal laws. Your pharmacy should implement any policies or procedures not addressed by the PharmCAP® program which are required for full compliance with any and all applicable state or federal laws regulating you, your pharmacy and/or any of your workforce members. Pharmacy shall refrain from discussing or disclosing in any manner with competitors Confidential Information regarding pricing issues, such as charges for services or products, discounts, allowances and all other terms and conditions of pricing related to third parties.